First, a full disclosure: this was a complimentary meal. I wasn’t asked to write a review or to promote the business in any way, so the opinions stated here reflect my own views with no sway from La Tasca. 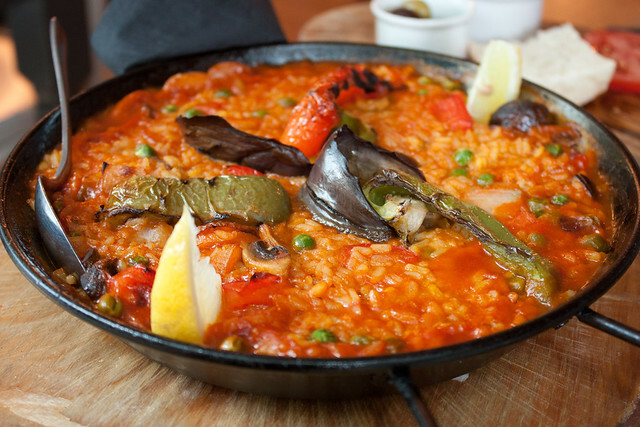 La Tasca is a contemporary Spanish chain serving a selection of largely authentic tapas and other regional dishes. My draw to the menu rested mainly in the fact that the restaurant caters for a range of diets, with allergy information provided for the entire menu. Furthermore the kitchen maintains a list as well, so they know exactly what is and isn’t suitable (and all of the staff are very helpful). What this means is a space where everyone can enjoy a tasty meal together at a reasonable cost. We started off with a bowl of salted almonds, but the dish I looked most forward to trying was the Padrón peppers (which I’d been told by multiple people are absolutely divine). To me it says a lot about any food when it can be served almost on its own, with little added ingredients, yet boasts a bold enough flavour to stand solo. These were served with nothing more than the oil in which they were roasted and a healthy sprinkling of salt (and no we didn’t get one of the hot ones). I could have made a meal out of these sweet peppers alone. Patatas Bravas: Fried Potato, with spicy tomato sauce. 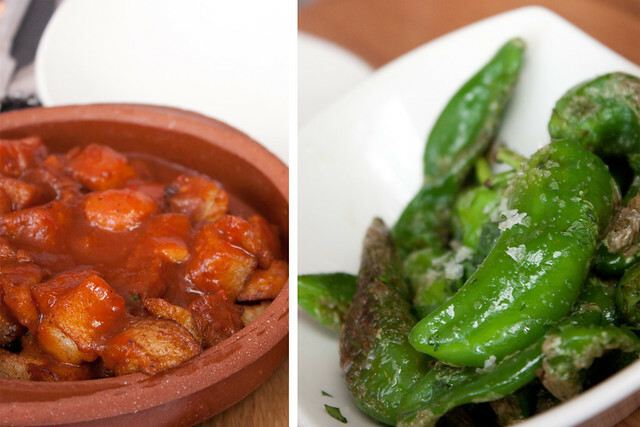 Pimientos de Padrón: Imported directly from Padrón these peppers are sautéed in olive oil and served with a sprinkling of sea salt. Beware: one in 10 in ‘extra’ hot! Patatas bravas are probably one of the most well known tapas dishes, at least in my experience, and I’m pretty sure it’s impossible to go wrong with deep fried anything. These deep fried potato chunks come topped with a smooth tomato based sauce and a moderate bite from the addition of chili to give it a little bit of a kick. The patatas bravas aren’t marked as vegetarian on the menu (let alone vegan, even on the allergen menu), but upon further questioning the reason is quite respectful to those of us who eschew animal products, and leads me to trust the labelling of their other items. I assumed the issue was one of everything being fried in the same oil, but that’s not the case; the oil for the patatas bravas is separate but it sits alongside the fryer for other items, hence there is a mild cross contamination risk. Thus for all intents and purposes the patatas bravas are vegan (I appreciate the honesty but I’d like to see this labelled more clearly on the menu itself as most vegans I know would be perfectly okay with this dish). Wheat, red quinoa and lentils, with avocado and rustica tomatoes, marinated in infused lemon oil. There are a few vegan options in the salad department, but we opted for the one that sounded the most bland (if something says “superfood” I tend to jump off the wanky train and hit up some deep fry) to offer some balance. Boy was I wrong about the potential meh factor because this salad was genius, well balanced, and full of flavour. 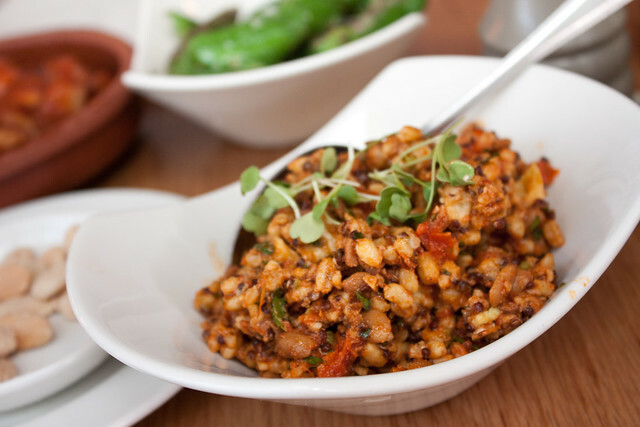 If you’re a fan of smoked paprika this should be your go to first choice tapa dish at La Tasca. 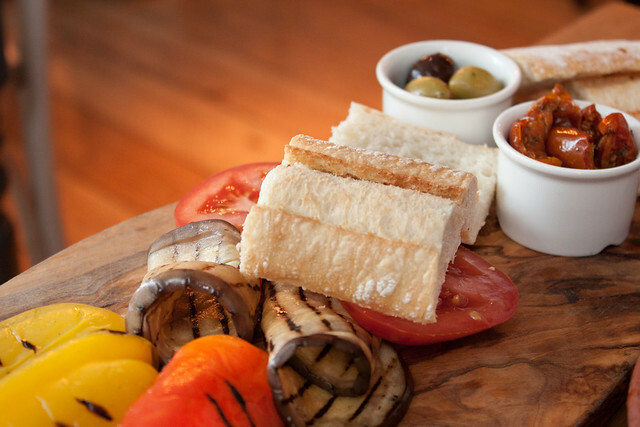 Char-grilled aubergine, green beans and peppers, with mixed olives, rustica tomatoes, Spanish ciabatta and an extra-virgin olive oil & sherry vinegar dip. These chargrilled vegetables (sans green beans on ours, though I only realised this after I left) are a great shared starter, but would also be perfect for a light lunch for one. This is summer day food at its best, again allowing the flavour of the vegetables to shine on their own without anything to adulterate. If you like simple wholesome Mediterranean flavours then this comes recommended (you’ll probably want to add some salt to the vegetables though). A vegetarian paella, with fresh seasonal vegetables and white wine, lemon wedges, char-grilled aubergine and peppers. How this was a dish for one I can’t fathom, because this was the biggest single-serving paella I’ve ever seen! The presentation was stunning and flavour wise it was good. Plus I think it’s great there’s a main meal option available for vegetarians and vegans (how often do we end up ordering multiple vegetable sides for a meal out? ), but texture wise this was more like a risotto than a paella. Not my favourite item off the menu, but I can think of at least half a dozen friends I know who I’m confident would enjoy it. The friend I took along for the meal happens to travel back and forth to Spain frequently, so it was useful to have alongside me someone who has experience with local Spanish food on a regular basis. Many of the dishes we chose were based on his opinion (which was good for me because decision-making is pretty much my least favourite activity), and according to him it was fairly legit Spanish fayre. 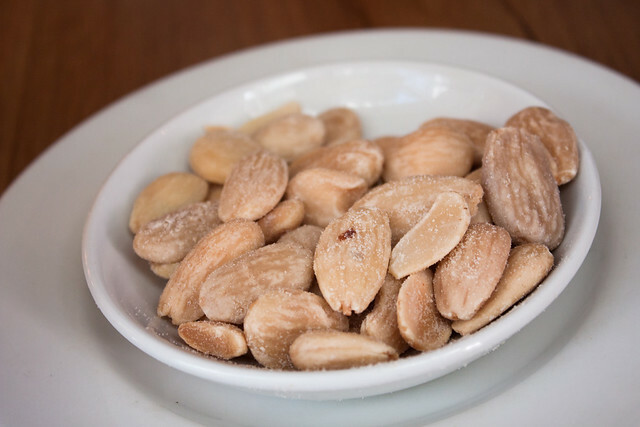 What strikes me most about La Tasca, or at least the branch at which we dined, is the quality of service and knowledge of staff regarding what’s actually in the food. This might sound like a silly observation, but it’s shocking how many restaurant kitchens are unaware of the contents of what they dish out. Presumably this is because some food comes in factory prepared, but that’s no excuse. I’m confident I can trust what these guys tell me about the food they’re serving, so for that reason I recommend it as a dining option to veggies, especially those in a group of omnivores who won’t budge on their need-to-eat-meat-always stance (everyone ends up happy). Lastly I must note I’m impressed at Victoria La Tasca’s ability, as a chain restaurant, to present as so personable – somehow it didn’t feel like a chain at all, and that’s a good thing.